The Ettore Majorana Foundation and Centre for Scientific Culture is named after an outstanding italian physicist. Born in Sicily in 1906, Ettore Majorana’s breadth of vision and exceptional contributions to theoretical physics moved Enrico Fermi to the following statement: «There are many categories of scientists, people of second and third rank, who do their best, but do not go very far. There are also people of first-class rank, who make great discoveries, fundamental to the development of science. But then there are the geniuses, like Galilei and Newton. Well, Ettore Majorana was one of them». 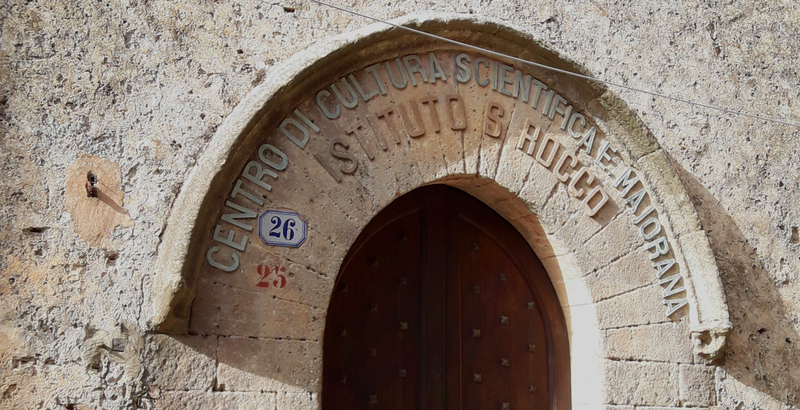 Every year since 1963, authors of new discoveries and inventions come to Erice; 85 of them were awarded the Nobel Prize after their participation in the Ettore Majorana Schools and 49 were already Nobel laureates when they started to take part in the Centre activities. These scientific world leaders teach to students from all over the world who are eager to receive the latest knowledge directly from the mouth of its authors. Embracing 128 Schools, covering all branches of Science, the Centre is situated in the old pre-mediaeval city of Erice where four restored monasteries (one of which was the residence of the Viceroy of Sicily during the XIV and XV Centuries) provide an appropriate setting for high intellectual endeavour. These ancient buildings are now named after great scientists and strong supporters of the ‘Ettore Majorana’ Centre. The San Francesco Monastery (former Viceroy’s residence) is now the Eugene P. Wigner Institute with the ‘Enrico Fermi’ Lecture Hall. The San Domenico Monastery is now the Patrick M.S. Blackett Institute with the ‘Paul A.M. Dirac’ Lecture Hall, ‘Robert Hofstadter’ Lecture Hall and ‘John von Neumann’ Lecture Hall. The San Rocco Monastery is now the Isidor I. Rabi Institute with the ‘Richard P. Feynman’ Lecture Hall, the Directorate and the main Secretariat of the Centre. The ‘Ciclope’ is now the Victor F. Weisskopf Institute with the ‘John S. Bell’ and ‘Richard H. Dalitz’ Lecture Halls. There are living quarters in all four Institutes for people attending the Courses at the Centre. The Polo Sismico, the first worldwide Network of Seismological Detectors (1981), is located in the I.I. Rabi Institute. The ‘Paul A.M. Dirac’ Museum is situated at the Patrick M.S. Blackett Institute. The conference site will be in San Domenico Monastry in Erice. According to legend, Erice, son of Venus and Neptune, founded a small town on top of a mountain (750 metres above sea level) more than three thousand years ago. The founder of modern history - i.e. the recording of events in a methodic and chronological sequence as they really happened without reference to mythical causes - the great Thucydides (~500 B.C. ), writing about events connected with the conquest of Troy (1183 B.C.) and the escape on the sea towards the West, said that the Elymi - founders of Erice - were survivors from the destruction of Troy. This inspired Virgil to describe the arrival of the Troyan royal family in Erice and the burial of Anchise, by his son Enea, on the coast below Erice. Homer (~1000 B.C. ), Theocritus (~300 B.C. ), Polybius (~200 B.C. ), Virgil (~50 B.C. ), Horace (~20 B.C. ), and others have celebrated this magnificent spot in Sicily in their poems. During seven centuries (XIII-XIX) the town of Erice was under the leadership of a local oligarchy, whose wisdom assured a long period of cultural development and economic prosperity which in turn gave rise to the many churches, monasteries and private palaces which you see today. In Erice you can admire the Castle of Venus, the Cyclopean Walls (~800 B.C.) and the Gothic Cathedral (~1300 A.D.). Erice is at present a mixture of ancient and medieval architecture. Other masterpieces of ancient civilization are to be found in the neighbourhood: at Motya (Phoenician), Segesta (Elymian), and Selinunte (Greek). On the Aegadian Islands - theatre of the decisive naval battle of the first Punic War (264-241 B.C.) - suggestive neolithic and paleolithic vestiges are still visible: the grottoes of Favignana, the carvings and murals of Levanzo. Splendid beaches are to be found at San Vito Lo Capo, Scopello, and Cornino, and a wild and rocky coast around Monte Cofano: all at less than one hour's drive from Erice.